The 77-year-old Vermont senator became a progressive political star in 2016 although he lost his candidacy bid. His campaign says it raised $1m (£777,000) within three and half hours of launching. 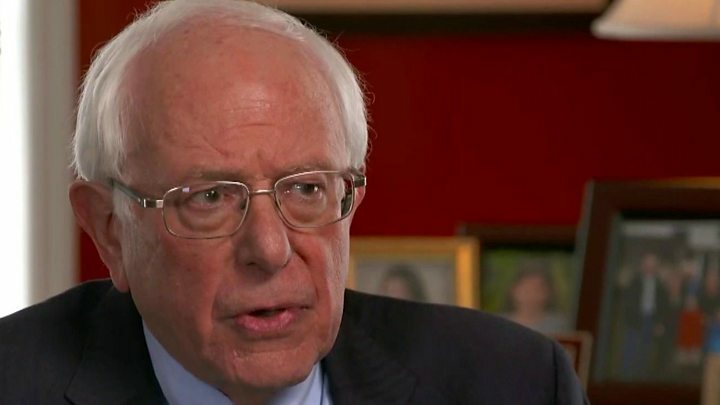 An outspoken critic of President Donald Trump, Mr Sanders has described him as a "pathological liar" and "racist". Mr Sanders - an independent who caucuses with the Democrats - is one of the best-known names to join a crowded and diverse field of Democratic candidates, and early polls suggest he is far ahead. His calls for universal government-provided healthcare, a $15 national minimum wage and free college education electrified young voters, raised millions of dollars in small donations and are now pillars of the party's left wing. Mr Sanders, who lost the 2016 Democratic primary to former Secretary of State Hillary Clinton, said in his email: "Three years ago, when we talked about these and other ideas, we were told that they were 'radical' and 'extreme'. "Together, you and I and our 2016 campaign began the political revolution. Now, it is time to complete that revolution and implement the vision that we fought for." Mr Trump, speaking to White House reporters on Tuesday, wished Mr Sanders well on his second bid. "Personally I think he missed his time," the president said. "But I wish Bernie well. It will be interesting to see how he does." "He ran great four years ago and he was not treated with respect by [Hillary] Clinton and that was too bad," he added. The president added that he liked Mr Sanders as they both have been "tough on trade". After building a grass-roots political movement that roiled the Democratic Party in 2016, Bernie Sanders is making another run at the prize. This time, he won't be the rumpled underdog. He'll start the race near the front of the pack - with advantages in small-donor fundraising, name recognition and a 50-state organisation of loyalists. His front-runner status will come with a price, however. Unlike 2016, when Hillary Clinton largely avoided confronting the Vermont senator for fear of alienating his supporters, his opponents will have no such reluctance this time. In 2016, the self-proclaimed "Democratic socialist" staked out a progressive agenda in contrast with Ms Clinton's pragmatic centrism. Now, in part because of Mr Sanders's efforts, the party has moved left on issues like healthcare, education and income inequality. His message is no longer unique. The senator will keep his devoted base, but will some former supporters opt for a fresh face? That could lead to conflict with those who believe a Bernie "revolution" is the only way forward, inflaming Democratic wounds not fully healed from the last campaign. In a crowded field, Mr Sanders has a realistic shot - but it could be a bumpy ride. Elizabeth Warren, Kirsten Gillibrand, Kamala Harris, John Delaney and Julian Castro are among those who have also announced their intention to run in the Democratic primary in 2020, the first time more than one woman has competed. If Mr Sanders is successful in his bid, he will become the oldest presidential candidate in US history. In his email, which lays out a series of policy issues, Mr Sanders also says: "You know as well as I do that we are living in a pivotal and dangerous moment in American history. "We are running against a president who is a pathological liar, a fraud, a racist, a sexist, a xenophobe and someone who is undermining American democracy as he leads us in an authoritarian direction." In response to the announcement, Trump campaign national press secretary Kayleigh McEnany said: "Bernie Sanders has already won the debate in the Democrat primary, because every candidate is embracing his brand of socialism. "But the American people will reject an agenda of sky-high tax rates, government-run health care and coddling dictators like those in Venezuela." Mr Sanders is the longest-serving independent in congressional history, but competes for the Democratic nomination as he says standing as a third-party candidate would diminish his chances of winning the presidency. He attended the University of Chicago, and in the 1960s and 1970s participated in anti-war and civil rights activism, like the 1963 March on Washington. He was first elected to the House of Representatives in 1990, the first independent to achieve such a feat in 40 years. He served there until he ran for and won a seat in the Senate in 2007. Mr Sanders entered the race for the 2016 Democratic nomination as a long-shot candidate but emerged as a surprise star during a series of televised debates. He labels himself a Democratic socialist, which he has defined as someone who seeks to "create an economy that works for all, not just the very wealthy". Mr Sanders also has a diplomacy-first attitude towards foreign policy and voted against the US invasion of Iraq in 2002. He became Mrs Clinton's closest rival, but she ultimately won the nomination before losing the presidential election to Mr Trump. In January, Mr Sanders apologised to female staff members on his 2016 campaign after allegations of harassment against senior aides emerged. Several aides complained of a "predatory culture" in his campaign and alleged that senior male staff had mistreated younger workers. Who is Democratic presidential candidate Bernie Sanders?